Septic tanks can play a vital role in helping your household deal with wastewater in a way that’s efficient, affordable and environmentally friendly. But they also need to be cleaned and maintained regularly to avoid costly problems from arising. If you need your septic tank emptying or cleaning, give the experts at Lanes Group a call. As leading drainage contractors and registered waste handlers, we can help you empty your septic tanks safely and responsibly, using a combination of powerful vacuumation and tankering equipment, and get everything back in optimal working order. With a network of 24 depots and a fleet of advanced 3,000, 4,000 and 5,000-gallon tankers operating across the country, we are well placed to deliver the support you need to keep your septic tank well-maintained and in top condition. For more information or a free quotation, call us on 0800 526 488, or fill in our online enquiry form to request a call back. Does my septic tank need emptying? Septic tanks need to be emptied out regularly to prevent the significant health and environmental risks that can ensue when the tank overflows or malfunctions. The question of how often a septic tank should be emptied is difficult to answer definitively, as this will depend on how many people are living in the household, and how often the tank is used. However, as a general rule, emptying the tank once a year can be a good guideline. For more information on looking after your septic tank, check out our septic tank maintenance guide. New rules came into force at the beginning of 2015 relating to discharge from septic tanks. If your property uses a septic tank, it’s important to read the new legislation and guidelines so that you are clear on your responsibilities. You can also check out our best practice guide on septic tanks for property owners for more information on how septic tanks work, and how to properly look after them. How can I prevent problems with my septic tank? As with any drainage maintenance problem, prevention is better than a cure, which is why it’s important to take basic steps to reduce the likelihood of septic tank blockages and other issues. The most important advice is to ensure that the tank is not damaged by washing harmful objects or substances down the drain. When flushing the toilet, its contents should be restricted to the so-called Three Ps – pee, poo and paper – which means no period care products, food waste, fats, oils, grease or anything else should ever go into the pipes. Even aggressive cleaning products can have a negative impact, meaning care should be taken when using these. The same is true when undertaking DIY septic tank cleaning – this should only ever be done with careful reference to the manufacturer’s guidance. If your septic tank is full and in need of cleaning and emptying, leave it to the expert team at Lanes Group. As the UK’s leading privately owned specialist drainage contractor, we offer an unrivalled tankering service that allows us to remove and dispose of vast quantities of sludge and slurry from overflowing septic tanks with a minimum of fuss. Aided by our state-of-the-art vacuumation equipment, our septic tank and cesspit emptying services can deliver optimum results with minimal disruption to you. 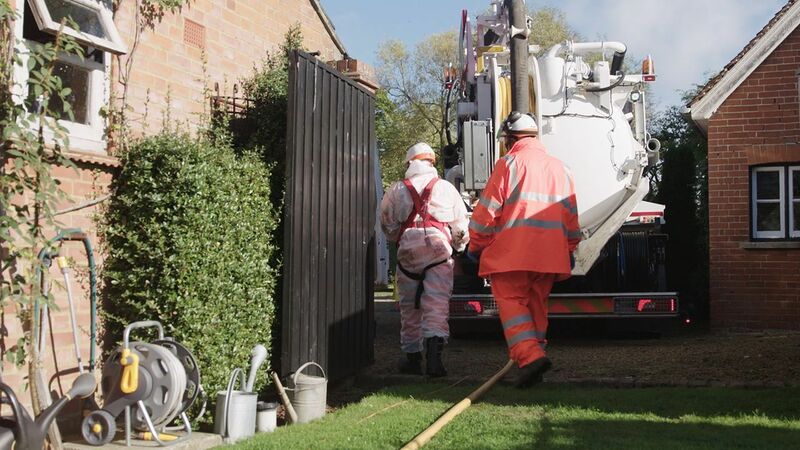 We also offer a septic tank cleaning service, in which our qualified professionals use jet vacuumation to clear all of the lines into the tank, check the soakaway and – if necessary- clear any debris around it, even if a man-entry clean is needed to do so. We’ll do everything in our capability to keep your septic tank system safe, efficient and fit for essential everyday use, so give us a call on 0800 526 488 for a free quotation, or use our online enquiry form to request a call back whenever you are available.